Today the plan was to go to Fuentes Georginas - beautiful natural hot springs in Zunil. We had visited here last year, and after seeing the photos on Facebook, Tyson had requested that we go there with him. Although it is a bit of a ride, it is definitely worth it! Craig had been saving up his energy for a few choice activities: the Mayan ceremony, the ruins at Iximche, and the hot springs. He has to be careful with hot springs, since his multiple sclerosis causes him to be susceptible to overheating and passing out. But he is disciplined enough to get out when he starts to overheat. Fuentes Georginas is located in the cloudforest, and really feels like a magical, spiritual, natural place. He couldn't pass up an opportunity to revisit this location. We left the house at 9 o'clock: Humberto, Paulina, Eddy, Aracely, Ian Ivan, Craig, Tyson, and me. Everybody was in the mood for a road trip. We insisted that Tyson ride shotgun so that he would have the best view and would have access to Humberto to ask any questions he might have. When we stopped to get gas, we all went into the convenience store to buy snacks. Aracely and I were amused by the locked display case of Gallo beer logowear, including socks! In Salcaja, we passed a statue at a crossroads where the Panamerican highway leads to Mexico and then to the USA. There is a statue here, commemorating those who have emigrated north to seek opportunities to help their families. These people sacrifice their safety and their own personal security and happiness to try to earn enough money to keep their families fed and clothed. This is the same situation that many of our own ancestors encountered, coming to the USA to seek a better life for their families. We saw this statue in the past and it has haunted us. We can't imagine the anxiety and grief of the family members left behind, who don't know the fate of those who have emigrated. The statue contains a prayer and a poem for the emigrant. It is something we would reflect on over our Independence Day holiday tomorrow. since you did not abandon the Migrant People. Help us achieve our purpose. Amen. you make the sweetest love. but prayer still unites us. we are the same heart. and the purity of the wind. and then one day succeed. I get back your love anew. As we approached the road to Fuentes Georginas hot springs, we found ourselves in a traffic jam that didn't seem to be moving at all. One by one, cars were turning around. Humberto got out of the van to ask the other drivers what was going on. It turned out that the road had been blocked by a demonstration. Protesters had closed the road from 6 a.m. until 6 p.m. to demand that an unfinished road construction project be completed. Passing the blockade would be akin to crossing a picket line, something we would never do. Not only do we empathize with the people who have no other alternative to make their voices heard than by physically blocking the road, but trying to pass could also make one a target for potential violence. We were disappointed that we wouldn't be able to visit the gorgeous natural grottoes in the cloudforest of Fuentes Georginas. It was an idyllic spot, and with Tyson's love of horticulture, the plants in the microclimate would be very interesting to him. Little Ian Ivan had his heart set on swimming, and it seemed a shame to have come all of this way for nothing. So rather than abort the mission entirely, we made the best of it at a roadside thermal bath house. We parked in front of the Baños Sulfurosos el Manantial, a long building which resembled a motor inn from the old days. We entered and Humberto paid for two rooms at a desk. There was a central corridor with door after door on each side. Each door led to a small cell-like room with a tiled recessed basin on one end. There was a window providing rather harsh diffuse light. Humberto, Paulina, Aracely, Eddy, and Ian shared one room, and Tyson, Craig, and I shared another. There was a tap for hot spring water and another for cooler water. Humberto had paid for an hour, so the hot tap would be available for 60 minutes. This was so radically different than the idyllic experience we had been expecting that we had to laugh. When we showed a photo to Craig's brother Steve, he called it a "Midnight Express bath house" in reference to the film. We turned on the tap and filled the tub with hot spring water. The water was quite sulfurous, and it felt good to sit in the tub and let the hot water relax muscles stiff from riding for hours in the car. I went next door to see how the family was doing. Eddy was not supposed to get his stitches wet. Although that would be very difficult at Fuentes Georginas where the kids like to jump into the deep pools, here it was easy to keep his head above water. So maybe it was for the best. The tub was the perfect sized pool for Ian Ivan, who laid on his stomach and squirmed around pretending to swim. When our hour was up, we got dressed and planned the rest of the day. We headed back the way we had come, stopping this time in Salcaja to buy some fermented fruit liquor. Craig and I had tasted this fruity cordial (known as Caldo de Frutas) in the past, and had heard that it was only made in a certain village. Salcaja was that village, and Humberto wanted to stop to buy some since we were in the neighborhood. While Humberto looked for a place to park the van, Tyson and I jumped out to take a photograph of the oldest church in Central America. The Church of San Jacinto (known as "La Ermita de la Concepcion") was built in 1524. It has a white stucco exterior with Catholic and Mayan motifs painted in bright colors. It is fortified by thick walls, and there are few windows. 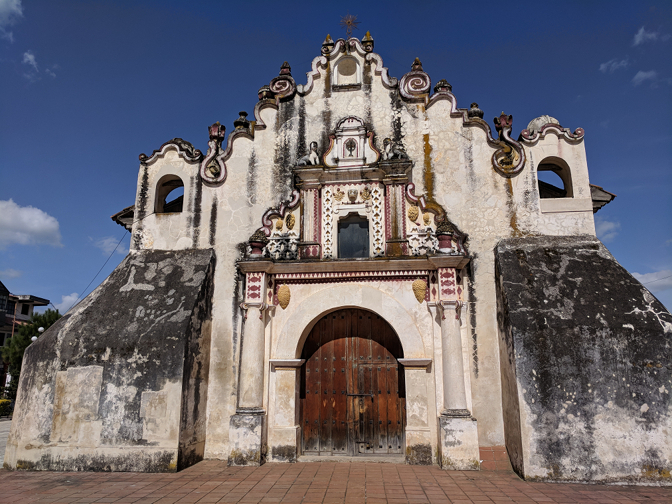 As the first Catholic church in Central America, it had to be protected from attacks, and the treasures inside had to be safeguarded from theft. We met Humberto at the van and we went into a tienda where he asked to buy Caldo del Frutas, the local liquor. The clerk told us that we needed to go next door, to the lawyer's office. This seemed very strange. We went to a building with a beautiful, colorful, colonial facade. Humberto knocked on the door, and a man let us in. Humberto asked about the liquor, and the man told us to have a seat while he went to get someone else. We took a seat in what turned out to be the lawyer's waiting room. There were framed pictures of Jesus and the Virgin Mary hanging over our heads. Soon a woman wearing an apron arrived. She placed two bottles of cherry-red colored liquor, a brandy snifter containing a sample, and a plate of fruit onto the table. Tyson and Humberto each bought a bottle of Caldo del Frutas. We thanked the woman, and she even let us take the remaining fruit as a doggie bag. It was a surreal experience to purchase home-made liquor in a lawyer's office! Next we went to San Andres Xecul, where we had visited a uniquely colorful church for the first time last year. San Andres Xecul translates to "Saint Andrew under the blanket," since it is in a part of the highlands which is considered to be significantly colder than surrounding areas. In the early 1900's there was no parish priest at this church, so the cofradia brotherhoods took it upon themselves to decorate the exterior of the church in a way which was pleasing to them. They employed fanciful motifs in bright primary colors. The facade of the church is yellow, with lots of three dimensional ornamental details including angels, saints, and flowers painted in vivid blues, reds, and greens. The angels appear to be frolicking, and one is even upside down. It is whimsical and you can't help but smile when you look at it. The steeple is topped with an ornate metal cross. At its base are two jaguar motifs, representing the Hero Twins of the Popol Vuh. This is yet another example of the syncretism which exists between pre-Columbian religion and colonial Catholicism. The interior of the church was closed for repairs, but we went into the coffee shop across the street. Xecul Cafe benefits the parish. The same young woman was working there as last year, and she was delighted that I somehow remembered that her name was Yolanda. I was pleased to see that they still had a couple of wall hangings inspired by the whimsical angels on the facade of the church. I had seen on the internet that they had starting selling these a couple of weeks after we visited last year. I love the style of the art, and today was my chance to buy one. We went upstairs and sat at two tables. Tyson and Craig sat beneath a trippy mural depicting the Mayan cosmogenesis. It looked like a jaguar mask and a monkey mask looking at one another with some sperm-like objects near them. We drank some delicious hot chocolate and fresh local bread. It was the perfect energy boost. As we drove out of town, Humberto spotted a tree which was ripe with cherries. He parked the van and led the family through a farm plot to the tree, where they picked handfuls of cherries. Craig and I waited in the car. It seemed sketchy to us, walking through someone's farmland and availing yourself of some of their produce. But maybe it is culturally acceptable here. Still, we were tired and rested until they returned to the van. Then we drove back to Pana. By the time we got home, we felt exhausted. But Paulina, Humberto, and the kids kicked right into gear, preparing dinner. They have a grill made from a wheel rim welded onto legs made of rebar. They grilled steak, sausage, and garlic. It smelled amazing and tasted even better! They served in with tortillas, home-made guacamole, black beans, rice, and salsa. Yum! Tomorrow Tyson and Humberto will hike Volcan San Pedro!